t was hard for us to make an appointment with Wiktor for him to deliver the amplifier for test, even though we live in the same city within a few kilometers. When finally came at 9 a.m. rushing immediately out for a rehearsal, I saw myself in him, the homo running. Wiktor is primarily a musician, he plays contrabassoon, trying to finish his doctorate on the Krakow Academy of Music, and only then he is also a designer and owner of Haiku-Audio. And a frequent attendee of Krakow Sonic Society. The proportions between all these activities begin to change, and the designer's passion starts to take over. His company is constantly developing. From a completely unknown company offering amplifier kits, it became a recognizable brand, and Wiktor had to start thinking about employing yet another person. Currently he makes only the flagship amplifier iovita by himself. Only the experiments with hybrid circuits gave satisfactory results. The solution was simple and innovative. 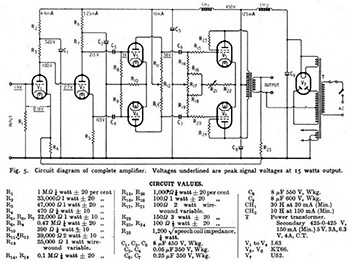 It turned out that instead of building a hybrid design by adding a single tube to the output stage of a solid-state amplifier, it was a better idea to add a single solid-state stage operating as a sort of a “super-output transformer” to a complete single-ended triode amplifier. Of all the available system solutions, one should choose the ones that using the available most up-to-date components present the most objective advantages in particular application. What our amplifier has to do with Williamson's original work is the overall topology. It is a frame that allows to build a device evoking the vintage sound. Ultra-linear mode. Originally Williamson used a triode power tubes, but for most modern speakers 10-15W output range is simply not enough. 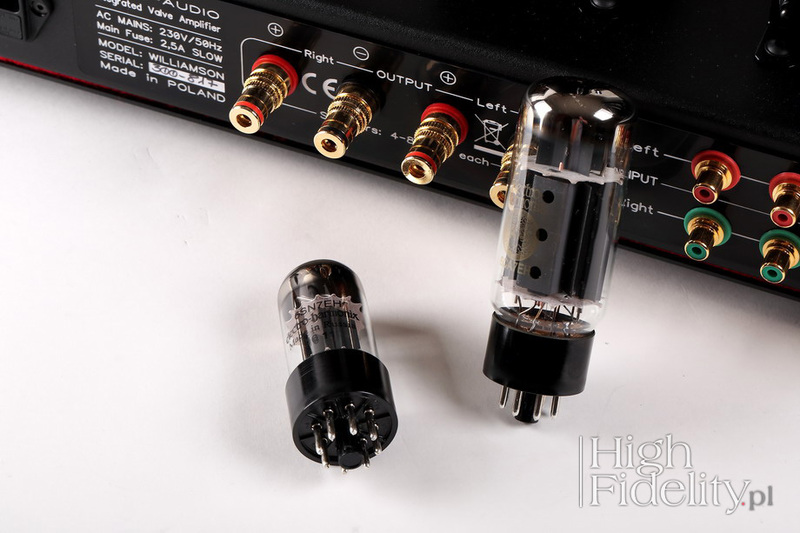 The ultra-linear mode preserves practically all the advantages of triode mode, but delivering twice the output. Application of 6CA7 tubes. Initially, the Williamson's amplifier featured KT66 tubes, and later the EL34s were extremely popular, because they seemed to be tailored for this particular amp. Contemporary 6CA7 is theoretically an equivalent to EL34, but in many respects it outperforms it. It is slightly larger, features a more rigid structure and an anode with a larger surface, so it can withstand higher loads without a risk of damage and without losing the fantastic sound quality of EL34 lamps. Semiconductor power supplies with stabilization. The available technologies and components that have been used for power supplies have significantly changed over the years. The low-noise , high-efficiency power supplies made today are capable of bringing the older circuits to even higher levels. Power output of 30 W, for better match to modern speakers, that are usually much more difficult to drive than the old models. Single output. User does not have to wonder if his speakers' impedance is 4, 8 or maybe 6 Ω. The amplifier has one output that accepts the full impedance range of modern speakers. There is no bias adjustment, operating mode switches, etc. Everything is automatic, so replacing the tubes is very simple - remove the old ones, inserts the new ones and you're ready to go. You do not need to mark the order or remember any settings. The Hommage á Williamson amplifier has been offered for the past three years as a Custom model built upon order. Each was slightly different, tailored to the specific system and user's preferences. This allowed us to gather the experience, which was used to create a serial, universal, user-friendly tube amplifier that offers the sound of the past and very modern parameters. 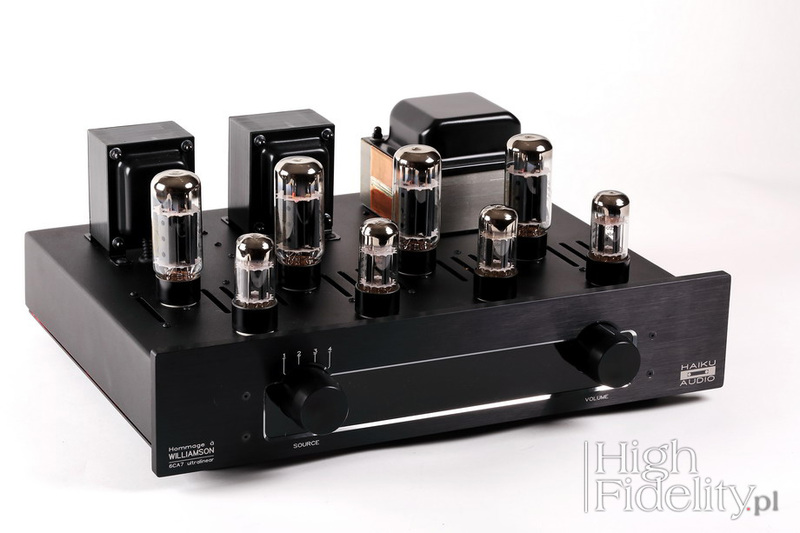 The tested version of the Hommage-Williamson amplifier is the first for Haiku-Audio, which uses the 6CA7 output tubes. This is an American version of the EL34 power pentode, which differs slightly from the Philips design, with a number of different operating characteristics, mainly in the lower voltage range of the first grid (-20 V). It can also be fed using higher anode voltage, resulting in higher voltages. Although nominally 6CA7 and EL34 are substitutes, in this particular case it is not recommended to replace one with the other. The device has typical Haiku-Audio appearance, which includes a distinctive front panel. The device features four unbalanced RCA inputs and single speaker terminals. Usually tube amplifiers sport two sets of outputs (except for Manley products) for 4 and 8 ohm loadings. The appearance of the device is characteristic for this type of product, i.e. with tubes and transformers placed on top of the chassis. There are four 6SN7 EH made by Russian company Electro-Harmonix. 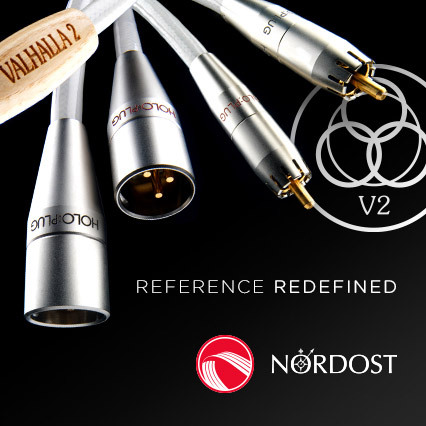 The same company also produced four 6CA7 tubes. What changed compared to previous projects are output and power transformers left without housings. This is a comeback to the original design and it looks very cool - vintage, but interesting. The on/off switch is placed on the side of the amplifier that does not have a remote control. 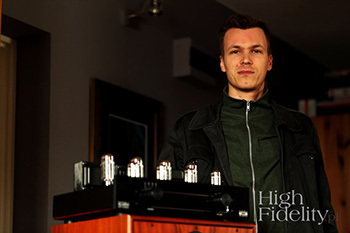 For a long time, Wiktor firmly refused to equip his products with a remote, arguing that it deteriorates sound quality. However, the demand from customers forced him to offer it as an option. The choice of David Theodore Nelson Williamson's choice (also known as D.T.N. Williamson, 1923-1992) for a patron for an amplifier is not accidental. His series of articles, published in the Wireless World magazine in April and May 1947 is widely recognized as the beginning of the "high-fidelity" era (though, let's notice, that the term was defined already in 1934 by the Radio Manufacturer's Association ). 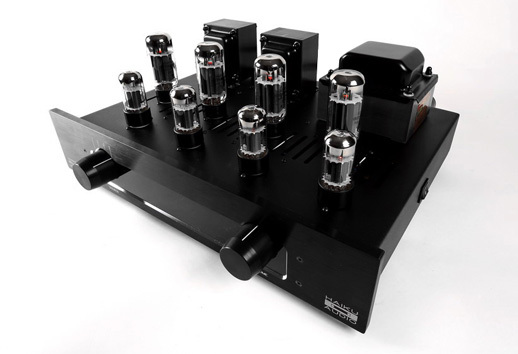 The cycle was named Design for a High-quality Amplifier. For two years, the amplifier existed only on paper, as a blueprint, however, it quickly began to sell in the form of kit and many people, especially ex-military, used it to build their first audio amplifier. To this day it is a very popular project in DIY community. The “Williamson amplifier” was a tube symmetric push-pull design using negative feedback and innovative ultra-linear mode. These solutions allowed designer to achieve a uniquely low (back then) distortion level of 0,1% at full power. The original configuration featured KT66 ("Kinkless" Tetrode) in the output stage driven with the L63 (6J5) which is the electric equivalent of the 6SN7 double triode. The voltage was filtered in the U52 rectifier. The original project used Osram tubes manufactured by the M. O. Valve Company, for which Williamson worked until 1946. 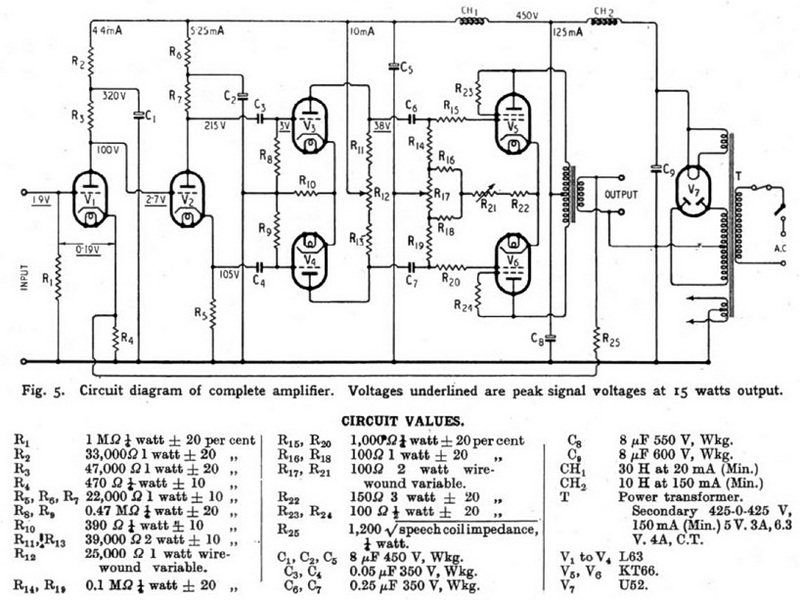 The second, modified version of the circuit was published in 1949. Over time, electronics and music lovers became more aware of its version with EL34 pentodes. I placed the amplifier on the top shelf of my Finite Elemente Pagode Edition rack, on its own feet.